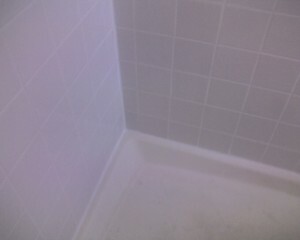 Ugly Black Grout & Caulk? Shower or tub leaking? We can help! These are the most common showers we run across in the Fredericksburg, Stafford and Spotsylvania Virginia area, a fiberglass pan with 4 inch white glazed ceramic tile. After years of water assault the grout & caulk need to be replaced, not only for looks… but to prevent water from leaking into the walls or outside the shower door to the floor. 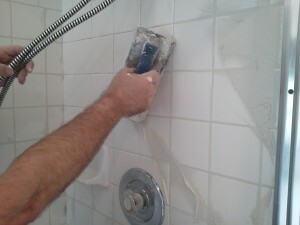 We offer a range of service from small grout repairs or re-caulking to a full shower over haul. 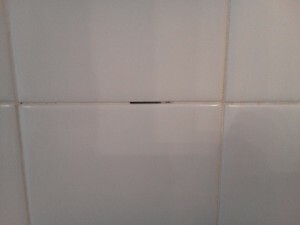 Even small spots of missing grout or caulk like in these photos below, can cause big trouble if left unattended. Pristine Tile & Carpet Cleaning is the leader in the Fredericksburg area for repairing and re-grouting showers and tub surrounds. 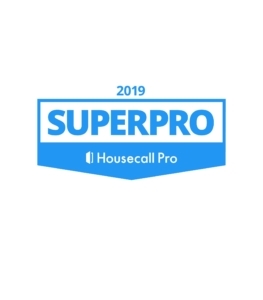 Our process includes removing all the old nasty grout and caulk, we then make sure all the surfaces are free of soap scum, body oils, mold and mildew. After the shower is completely dry and clean, we then float in the new grout. 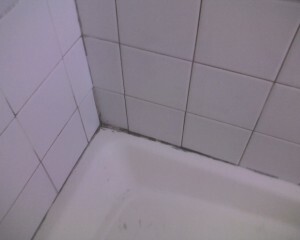 The grout will take some time to dry and cure before we apply a matching caulk around the corners and edges. On all of our grout jobs we mix the grout with an acrylic additive instead of water, we find that this makes the grout stick better, cure better, is more uniform as well as water and stain resistant. All our grout jobs come with a 1 year warranty. Below are some links to our tile grouting and repairs if you are interested in learning more about what we can do.